Portland, Oregon and southwest Washington weather from the FOX 12 Weather team. I was out working in the yard/garden this weekend and it’s pretty obvious we could use a soaking. Here comes a night with some good downpours, but only for some of us. The issue is that we don’t know exactly who is getting the soaking tonight; although we have a general idea it’ll be in the far northern part of Oregon and SW Washington. 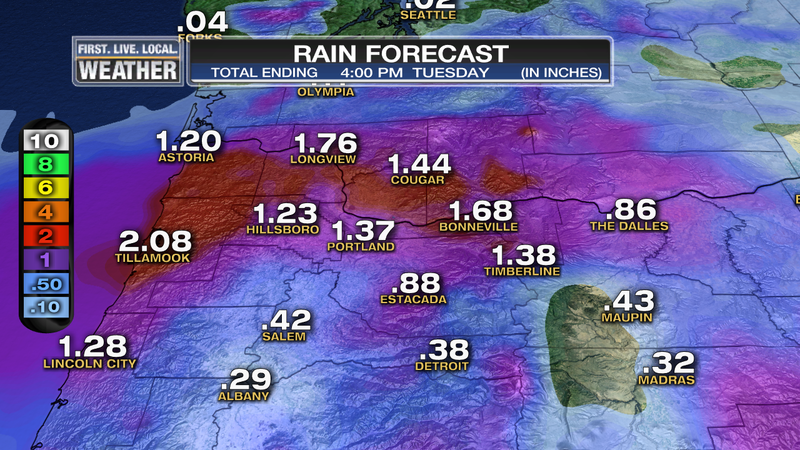 It’s soaking the Portland metro area with around an inch of rain, possibly even higher. The pink area indicates 1.28″ or more. The band of heavy rain appears to be centered from the central Oregon coastline across to Mt. Hood. 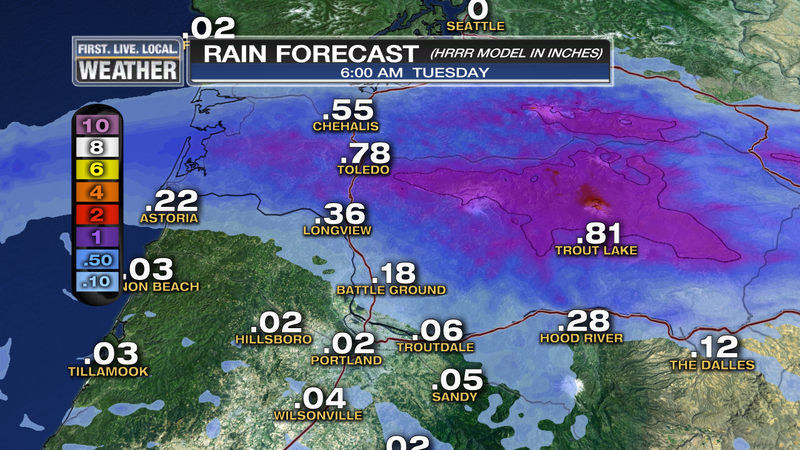 Our RPM forecast has similar, or slightly higher totals, but has the main action farther north. Notice just south of the metro area the totals are significantly lighter. The HRRR model, which only goes out to 15 hours, has the soaking rains even farther north. Note only a few sprinkles south of the Columbia River by sunrise…seems too far north to me based on what we’re seeing on radar so far. So the big picture is that a large area somewhere between Eugene and Olympia should get a soaking within the next 24 hours. Regardless of the totals, Tuesday appears to be a rainy and cool day for most of us. In fact I don’t see a good chance for dry weather activities (that need many hours of dry weather) until the 2nd half of the week. We have two more upper-level lows that move inland over the West Coast, one on Thursday and one Sunday. Both of those are moving into California, which means not a lot of rain here. 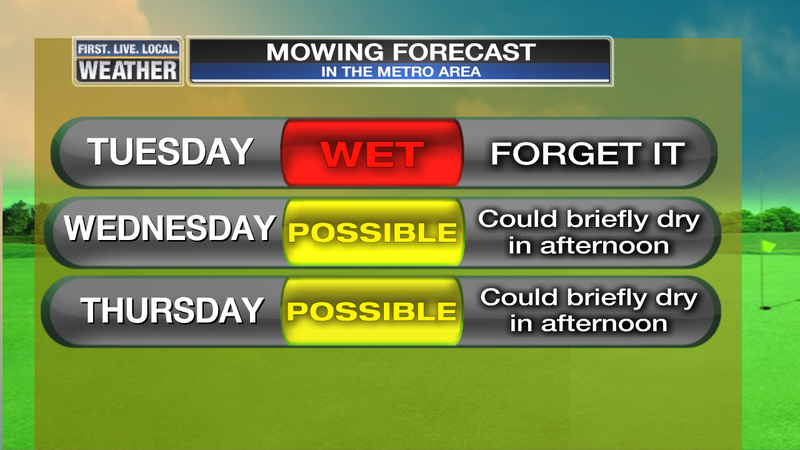 We could still see showers after Wednesday, but they should be far more spotty. You are currently browsing the FOX 12 Weather Blog blog archives for the day Monday, May 11th, 2015. Commenting on this blog is open to anyone with an interest in or fascination with weather. Here at FOX-12 we're happy to provide you a space to "geek out" with fellow Pacific Northwesterners. But please don't abuse the privilege. Choose a name or identification once and stick with it. The very first time you comment it is held for moderation. After it's approved, that EXACT name will be allowed to comment at any time. Note that this applies to your IP address too. So using the same name but on Grandma's computer will require a one-time hold as well. This keeps the spam out. This is pretty obvious, but avoid being rude or taunting others too. This will get you kicked off quickly. Please report this to me at mark.nelsen@kptv.com if it happens here. Spring So Far; As Normal As It Gets!